To filter a single data field by multiple values, you have to use the CompositeFilterDescriptor object. It contains a collection of filter descriptors objects and the logical operator for that filters. The composite filters allow you to create more complex filtering expressions. Such a complex filtering expression might include filters for multiple fields combined with different logical operators, like (UnitsOnOrder= 0 AND (UnitsInStock> 100 OR ProductName.StartsWith(“G”))). 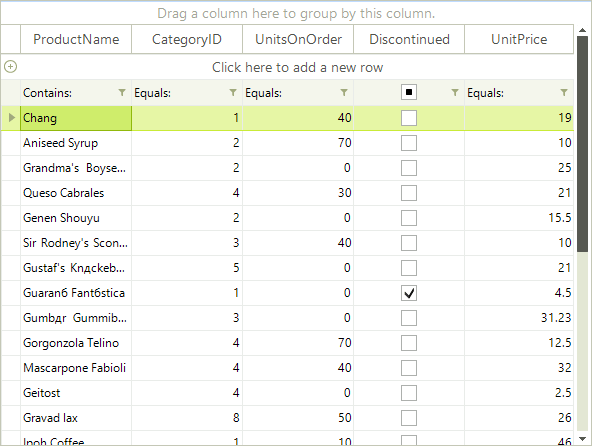 The following example shows how you can add descriptors that will be reflected in the Excel-like filter popup.